Following the success of the first year of the Ro’Ya initiative, launched in January 2014, MasterCard and the Dubai Business Women Council (DBWC) are continuing their joint focus on driving entrepreneurship in the UAE by welcoming applications for a second year. Ro’Ya aims to empower women in the UAE by offering mentoring and coaching to existing and aspiring entrepreneurs who are keen to set up new businesses in the UAE. The initiative also rewards the top three winners with funds to be used towards their initial start-up costs. The top prize winner will receive the equivalent of usd 50,000, with second and third prize winners taking home the equivalent of usd 30,000 and usd 20,000 respectively.Submissions will be accepted until May 30 and the competition is open to all budding female entrepreneurs who are citizens or residents of the UAE. 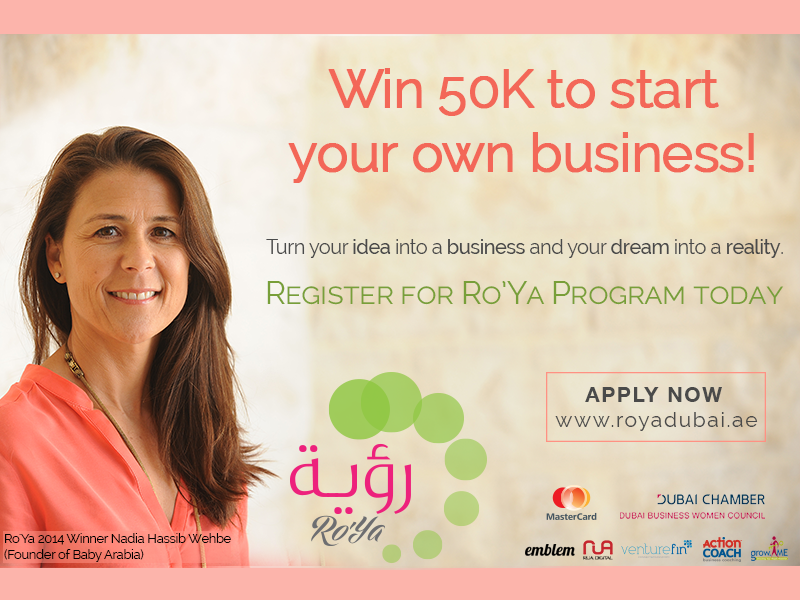 Participants are encouraged to submit their business proposals through the Ro’Ya website (www.royadubai.ae), which also contains additional information on criteria and judging. Submitted entries undergo a thorough screening process by a panel of experts from MasterCard and DBWC. Shortlisted candidates will then be invited to present their ideas to judges at a closing gala event.All applicants will also have the opportunity to learn from a team of experts during workshop and seminar sessions that focus on how to create and manage a successful business.